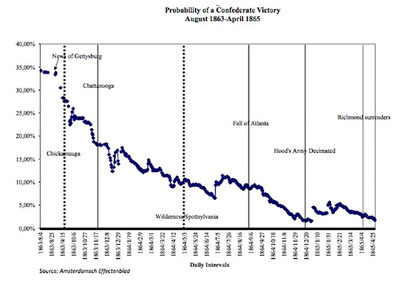 The bond market knew the South couldn’t win the Civil War. According to a new Centre for Economic Policy Research discussion paper, (via WaPo’s Matt O’Brien), European bond markets during the Civil War showed that at most, the South had a 42% chance of winning. The paper’s abstract said the researchers used the market’s pricing of the probability that debt would be repaid as a proxy for that side’s chance of winning a civil war. 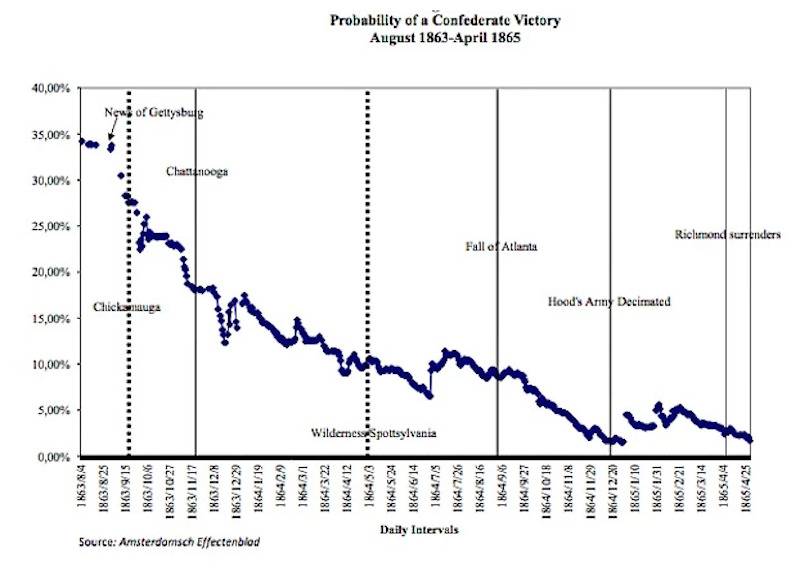 The odds of the Confederacy winning the Civil War plummeted to 28% September 1863 after that July’s battle at Gettysburg, and the bond market marked the South’s chances of the South winning the war down from 28% in September 1863 to about 10% by May 1864. The Civil War, however, didn’t officially end until May 1865. The bond market is closed for Veterans Day on Tuesday, and fortunately there is no civil war for today’s traders to predict the outcome of: today, we’re only guessing at when the Fed will raise interest rates.